This battery pack has an additional USB port where you can connect a USB-compatible charging cable and charge two mobile devices at once. Convenient Battery Check There is a battery level check button on the side of the device that allows you to verify what charge is left in your Galaxy 11300 mAh Portable Battery Pack. 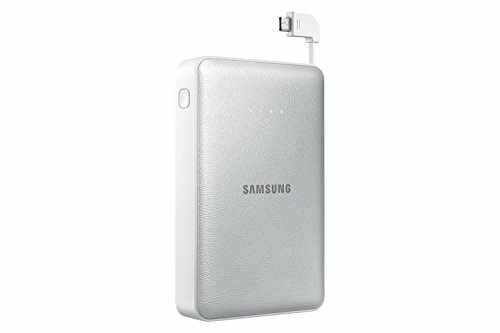 When your Battery Pack is getting low on power, you can recharge it back to full power using a standard wall charger or the included short cable (micro USB to USB) Compact Design for Portability The size of the Galaxy 11300 mAh Portable Battery Pack is also ideal for travel and on-the-go use. It easily fits into a pocket, purse or bag to charge your phone while you're moving. The design also complements your Samsung Galaxy device. Charges a wide variety of micro USB compatible devices - including the complete Samsung Galaxy line up. Hide-Away Charging Cable The Galaxy 11300 mAh Portable Battery Pack hides an integrated micro USB charging cable that can be pulled out and retracted in a moment so you don't have to carry around extra cables with you for charging your micro USB device on-the-go.